What a Nice Debate About Violence. Wait, What is Luigi Doing There? You have to hand it to the BBC. It's always exciting to see an adult, nuanced debate about responsible parenting. Wait, what is Luigi doing there in the background? 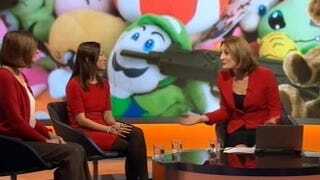 Today on BBC World News, in the midst of an otherwise rational discussion about toy guns and media violence, someone decided to confusingly photoshop guns over a bunch of Nintendo and Hello Kitty plushies. I get the point, but it was like looking at an insane photoshop salad. The funny part is, it was a totally rational, reasonable discussion — both sides made fair arguments, and everyone involved limited their use of hyperbole. But it is sort of hard to take any of that seriously when it looks like Luigi has the barrel of a submachine gun pressed up against his nose. Still, it's leagues better than what we have in the states.